Until a few days ago, the only people I’d heard use the word “hydroponics” were saying it while rolling a joint. They were probably listening to 311 and wearing flip-flops held together with duct-tape, too - I can’t remember. But at the Saturday farmers market, I heard the word “hydroponics” come out of the mouth of a clean-cut, probably-not-stoned young girl working at the Beylik Family Farms stand. She was selling me Japanese tomatoes (which are particularly sweet and low in acidity) for $3.50/pound and explaining to me why the word “organic” didn’t appear on the stand’s signage. She told me that Beylik Family Farms near Fillmore, California (distance from me: 62 miles) has been growing mostly tomatoes, peppers, and cucumbers hydroponically since 1971. “Hydroponic” plants are grown indoors without soil, using only a nutrient solution. I recently spoke with Laura Beylik, who lives and work on the farm with her husband, Scott. Laura sells their products at markets with a team of six, while her husband avoids the market “like the plague,” preferring to stay on the farm where he works with eight employees. Scott inherited the farm from his father, who retired about five years ago, and his grandfather, who passed away about ten years ago. It comprises two properties: Scott and Laura live on close to 15 acres, while his parents live right across the street on 6.5 acres. Laura explained that the farm is semi-hydroponic, since their greenhouses use natural light and true hydroponic farms use only artificial light. The Beyliks also use coconut husks and Grodan Rockwool as a “medium” to support the plants’ root systems and hold moisture. Contrary to my first assumption, “Rockwool” is not the fluffy result of shearing your pet rock. Rather, it’s a man-made mineral fiber made by melting basaltic rock and then spinning it into a fibrous material. The highest quality Rockwool is produced from diabase (pure basaltic rock) and has a mineral balance completely inert and nonreactive with nutrient solutions. Apparently, the hydroponic and organic growing communities have been embroiled in a bit of a feud for the past fifty years or so. Organic growers care about improving the biological health of the soil by minimizing degradation and erosion, while hydroponic growers cut the soil out of the process all together. For many of us, the word “organic” has become kind of a synonym for “good for the environment.” And organically grown food certainly is better for the environment than conventionally grown food, despite recent research on its arguable health benefits. But it’s not the only environmentally friendly way to grow food. 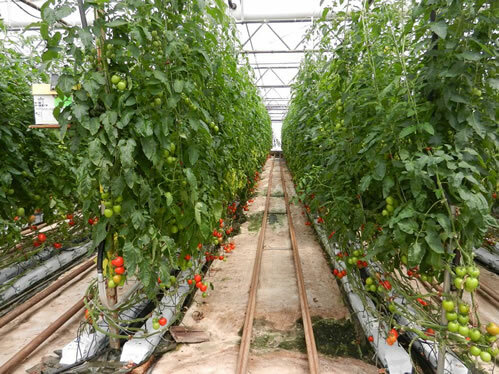 Hydroponic plants have smaller root systems so they take up less room than soil-grown plants, and they’re not plagued by weeds or soil-borne diseases. Plants are able to access nutrients as they need them, and no water is lost in the process. I’m glad I learned a little more about hydroponic food so I can expand my local diet. And in my opinion, these Japanese tomatoes taste just as good as their organic counterparts. I have been eating one of them while I write this post, simultaneously blasting “Hydroponic” by 311 on loop, just to get in the mood. Don’t worry - I made sure to save one of the tomatoes to use in self-defense against my neighbors, who have got to be getting tired of this song.